The countdown for the 230th birthday of Los Angeles is underway, and The Museum of the San Fernando Valley will be dedicating several events during the year to get folks in the mood for the big city-wide fiesta of historical and cultural groups that will mark the occasion. Throughout the year, The Museum Community will be collecting and sharing special images of our city's rich history and culture. Here's a great photograph from our Archives, donated to The Museum by Gary Fredburg this month. 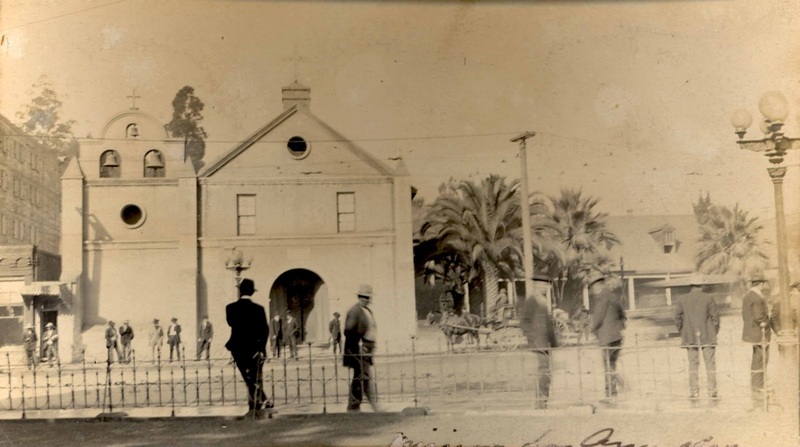 It features the oldest church in our City, the Mission church of Our Lady Queen of Angels at the edge of the historic plaza. Note the porch attached to the Mission at the left and the house at the right, now long gone. Burials were made at the left of the church's entrance, commonly called El Campo Santo - present site of considerable controversy. 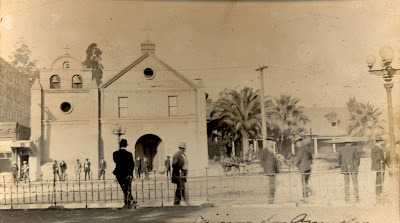 Date of this photo is unknown - double click on the image to clearly see the horse and buggy and how close building were to the church. HAPPY YEAR OF THE RABBIT EVERYBODY!